Today marks Be Quiet! 's entry into the chassis market. 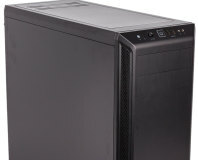 We first saw this début product at Computex earlier this year, and it's since been named the Silent Base 800. 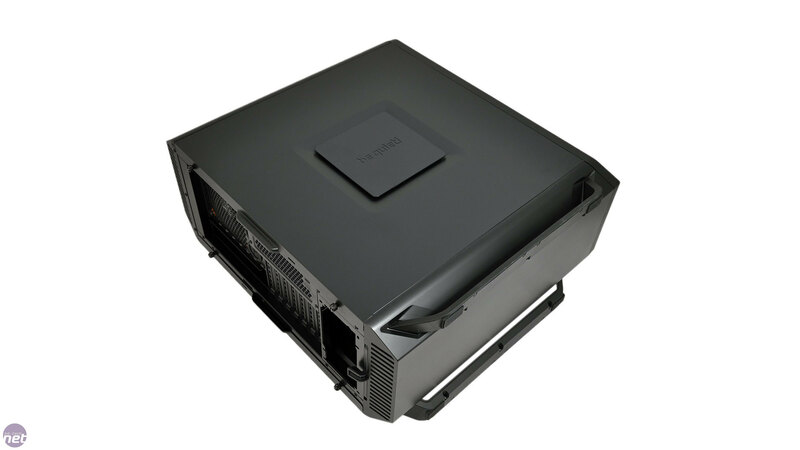 As we reported back in June, the case has been designed from the ground up to offer both low noise and reasonable cooling. It's available in three colours: all black, black with orange and black with silver, all of which are pretty smart looking to our eyes. We particularly like our black and orange sample as the orange makes for a change from the norm without being overdone. All three versions come with a three year limited warranty. 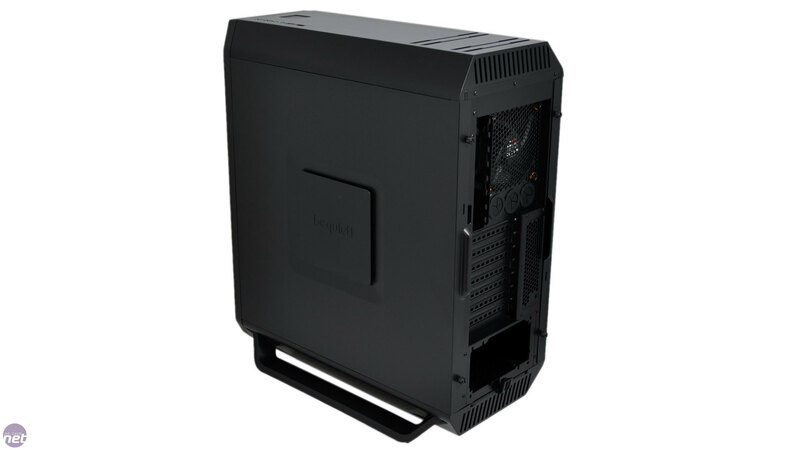 The first thing you notice when unpacking the Silent Base 800 is that its case stands are supplied separately, and aren't fixed to the chassis. These increase the case's width by 36mm and the height by 17mm, but unless you desperately need this space there's no reason not to use them, as they bolster that case's stability and grip thanks to the rubber soles. As with almost any case below £100 (and many more above this), plastic is used on the external roof and front panels. 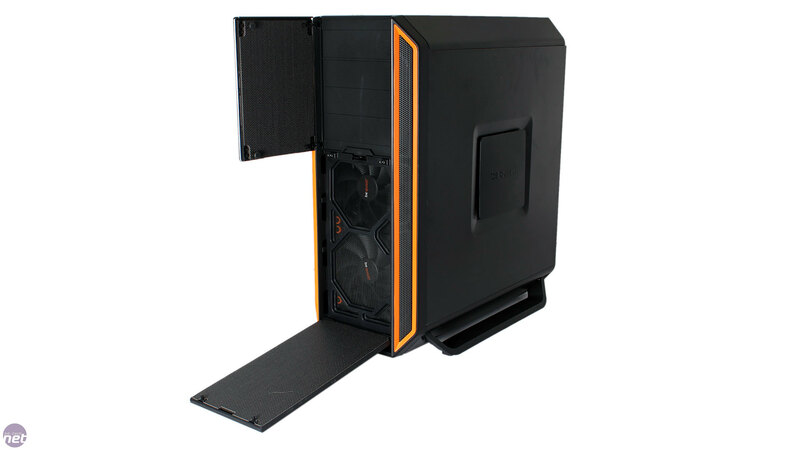 There is flex if you press on these panels, and the same is true of the steel side panels as well. Overall, it's still fairly solid, but even so for close to £100 we expected just a little more in terms of build quality. 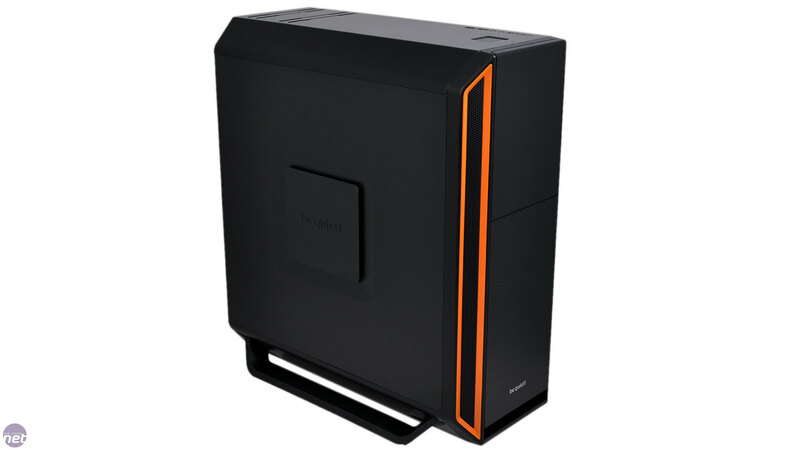 The front magnetic door covers the trio of optical drive bay covers, and is backed by a thick foam-like material made in part from nylon and newly developed by Be Quiet! for this case; it's also found on the reverse of both side panels, its purpose of course being to insulate sound. If you're unhappy with the direction the door opens, you can remount the hinges on the other side. 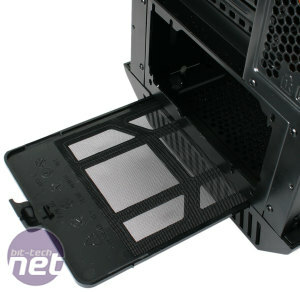 Meanwhile, the lower section of the front panel comes away using two push-clips, revealing a dust filter that covers the two front fan mounts. This filter can also easily be clipped out for cleaning. Behind the dust filter we find two 140mm fans installed. 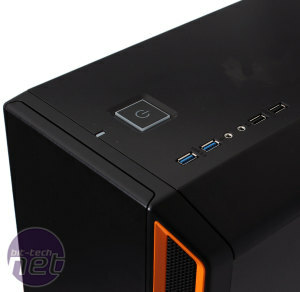 Vents down the sides provide an inlet for air, but the otherwise solid front panel will still impede airflow compared to cases equipped with more mesh – a common trade off in low noise cases. The dual intakes are complemented by a 120mm rear exhaust. All three fans are Be Quiet! 's own Pure Wings 2 models, and they use 3-pin headers. However, Be Quiet! will be supplying a low noise adaptor for the rear fan, as the company claims its internal tests have shown that its speed can safely be lowered. We haven't seen the cable ourselves, as it did not make it into the first production run. However, any users who purchase a Silent Base 800 from this first batch can order their cable for free (including free shipping) from Be Quiet! 's support page. 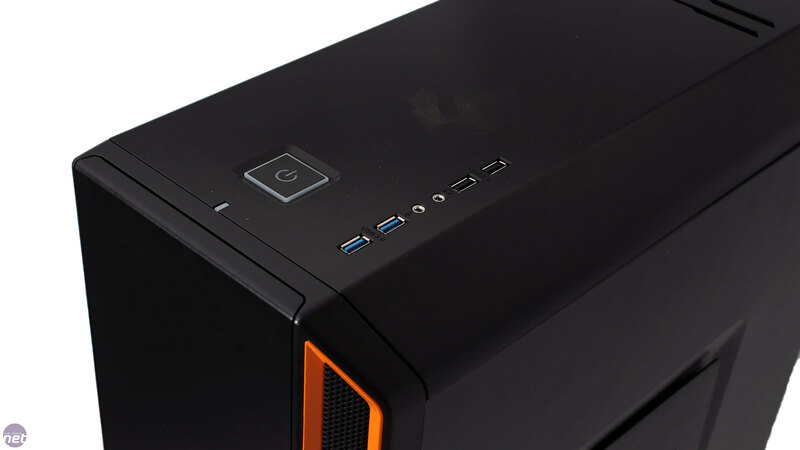 The front I/O panel is found on the roof, with easy access to all ports and the big power button. It's well connected, but sadly there is no fan control to speak of. Enthusiasts may well prefer their own fan control solution, but Be Quiet! 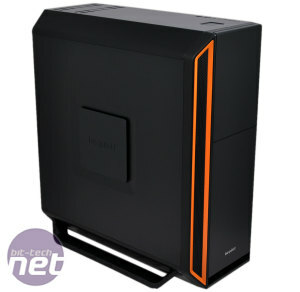 itself admits that the Silent Base 800 is not aimed solely at such users, and the presence of fan control in a number of cheaper low noise cases makes its omission here more glaring. Further back down the roof panel we find some ventilation slits along the top and a few more right at the back. 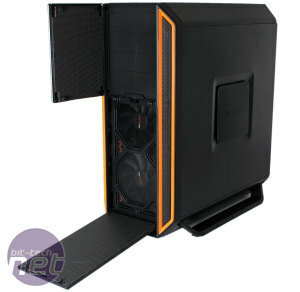 It's not that much ventilation, so airflow will be limited, but Be Quiet! claims the design allows air in while deflecting sound waves back into the chassis away from the user. The two side panels are identical, and each one has a blanking plate installed almost directly in the middle of it. This plate covers a 120mm fan mount, though it can only be used on the left panel as there isn't space on the right (nor would there be much point). A single 120mm dust filter is supplied should you choose to use this fan mount, and the blanking plate can be re-installed once the fan is in place to help contain noise. 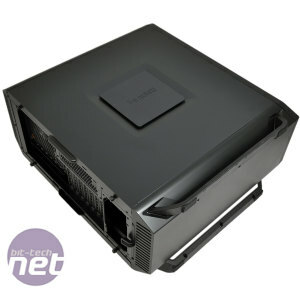 There's a lower removable dust filter that covers both the PSU and the bottom fan mount. 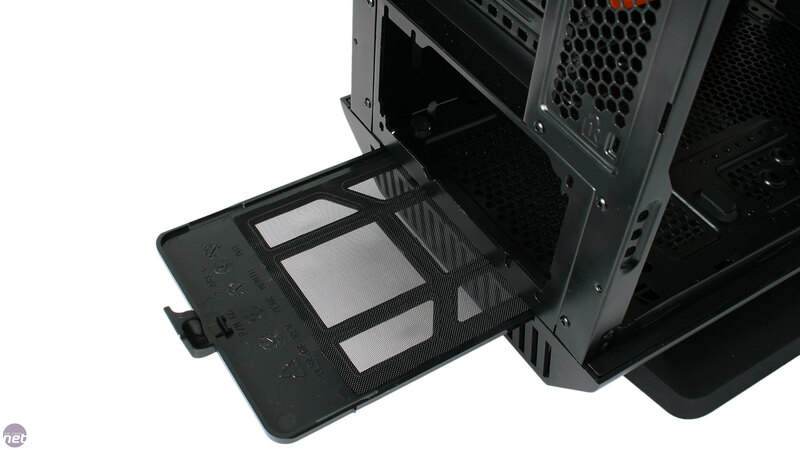 A slot between the bottom of the core chassis and the plastic lower panel ensures that sliding the filter in and out of place is very simple. 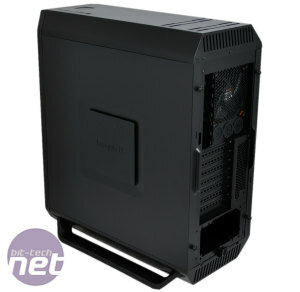 Anyone looking to take advantage of the bottom fan mount should note that there's very little space for air to reach it, as the bottom panel is almost entirely solid.